Introducing (re-introducing?) the Hormone Horoscope "Classic" App! Introducing (re-introducing?) the Hormone Horoscope “Classic” App! Home > app > Introducing (re-introducing?) the Hormone Horoscope “Classic” App! 11 Jul Introducing (re-introducing?) the Hormone Horoscope “Classic” App! It’s back: The Hormone Horoscope App that started it all! I’m reintroducing the first Hormone Horoscope App: This is the one with the pink Cycle Calendar, “egg” ovulation day and simpler interface (no integrated day/month calendar). Even though I got plenty (and I mean plenty!) of emails, tweets, etc. begging me for an integrated day/month calendar and to ditch the pink, once I did just that, I got just as many emails, tweets, etc., from users who missed the simple design and all that pink! 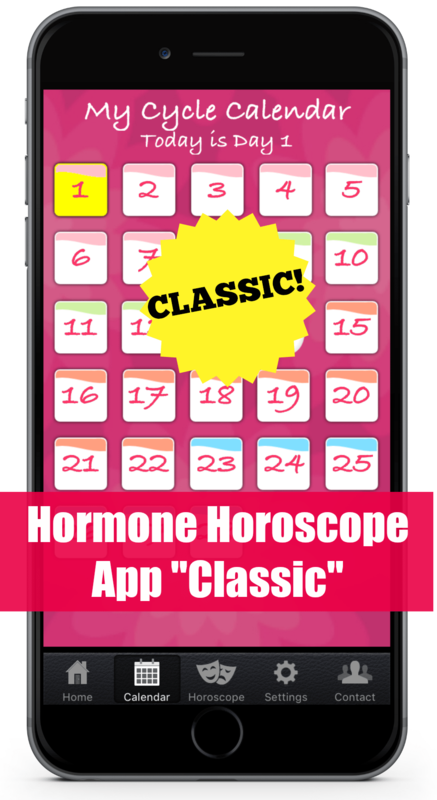 So, now you have your choice of apps: You can download my free Hormone Horoscope “Classic” (the pink one) or the new free Hormone Horoscope “Lite” (with the day/month calendar). Or download them both. They’re separate apps — and both are free — so you can have both on your device at once. Don’t forget, the Hormone Horoscope “Pro” ($1.99) is the app that contains the much longer, detailed daily Hormone Horoscopes that are organized by category–mood, energy, money, romance, etc. And, it’s the one that helps you plan into the future by showing you your cycle dates months and years from now. (I’m using that to plan a future dentist appointment this week!) So, obviously, I’d love for you to give that a try. Download the new (old?) Hormone Horoscope “Classic” or other Hormone Horoscope Apps at Google Play and the App Store.